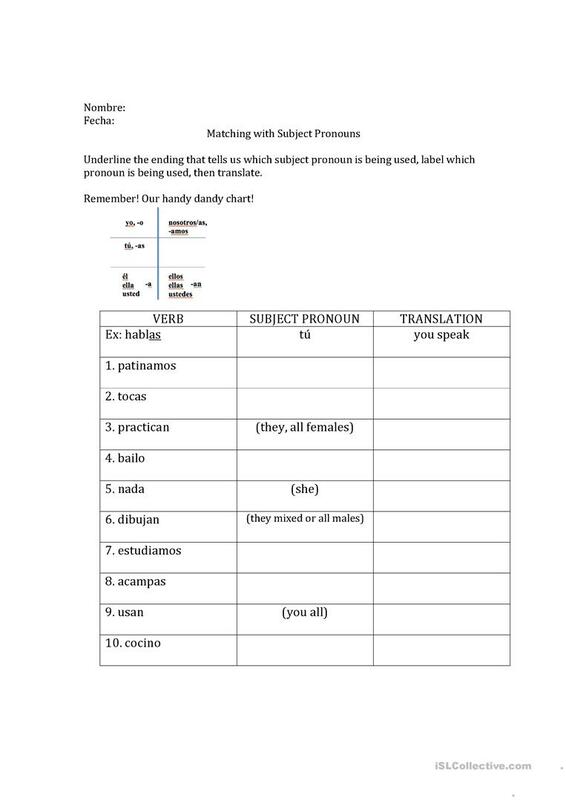 This is a reinforcement worksheet for students to understand, on a deeper level, what the Spanish subject pronouns are. This worksheet also deals with translation of simple -ir, -er, and -ar verbs. The present downloadable printable is recommended for high school students at Pre-intermediate (A2) level. It is valuable for consolidating Personal pronouns in English, and can be used for enhancing your class' Spelling, Reading and Writing skills. It focuses on the vocabulary topic of Actions. loganj is from/lives in United States and has been a member of iSLCollective since 2012-04-16 20:20:51. loganj last logged in on 2012-06-18 12:07:31, and has shared 4 resources on iSLCollective so far.